ELHistSoc -George Meredith, Whiskey. Rags to Riches Story. George Meredith, Whiskey. Rags to Riches Story. George W. Meredith, one of the leading business men of East Liverpool, distiller, jobber and importer of wine and liquors, was born at Utica, New York, April 7, 1850, and is a son of Thomas and Elizabeth Meredith. The parents of Mr. Meredith died when he was a child and he has practically made his own way in the world from boyhood. The father was so Welsh extraction. In 1853 the father moved the family from Utica to Trenton, New Jersey, and died soon afterward. Mr. Meredith was educated in the public schools of Trenton. Which he attended until he went into a pottery to learn the trade of potter. In 1877 he came to East Liverpool, Ohio, and worked for one year for George Morley and then entered the great pottery house of Knowles, Taylor and Knowles, remaining with this firm until 1880. In this year he embarked in business for himself, engaging in the bottling business in a small way, utilizing at first a small store-room at No. 177 Market Street, with dimensions of 25 x 60 feet. In contrast, he today occupies the entire block including Nos. 171 to 179 Market Street, two floors and basement; the building was once known as Brunt's Opera House. Eight years ago one man did all bottling in addition to performing other duties, while now 23 employees are required to handle bottling. This is a largest wholesale liquor house in Eastern Ohio and most extensive whiskey bottlers in America. The leading brands handled are: "Meredith's Diamond Club Pure rye,""Meredith's Malt Whiskey" and "Meredith's Celery Gin Tonic." The whiskeys are handled by the largest and best wholesale druggists and dealers from Maine to California and from Canada to the Gulf. Mr. Meredith one of the incorporator's of the Crockery City Brewing and Ice Company, and is president of The Colonial Company, Potters. Mr. Meredith as a fine home in East Liverpool in an interesting family. He married Annie Heath, who is a daughter Richard Heath, of Trenton, New Jersey, and they had eight children, namely: Amelia, wife of John McDonald, of East Liverpool; Richard, of East Liverpool; Annie; Thomas; Willis, and three deceased. Mr. Meredith is fraternally connected with East Liverpool Lodge, No. 258, B. P. O. E. And the East Liverpool Aerie of Eagles. He is a man of enterprise and public spirit and in all we sent chills is a first-class citizen. History of Columbiana County, Ohio and Representative Citizens. Edited and compiled by William B. McCord, Salem Ohio. Published by Biographical Publishing Company. Chicago Illinois (1905) pp. 623 – 24. THE EVENING REVIEW FEATURE PAGES Saturday, Jan.20, 1973. Even the old-timers have forgotten the taste of his product, but antique collectors avidly seek the containers once used by a 19th century entrepreneur who built up the largest whiskey bottling plant in United States. 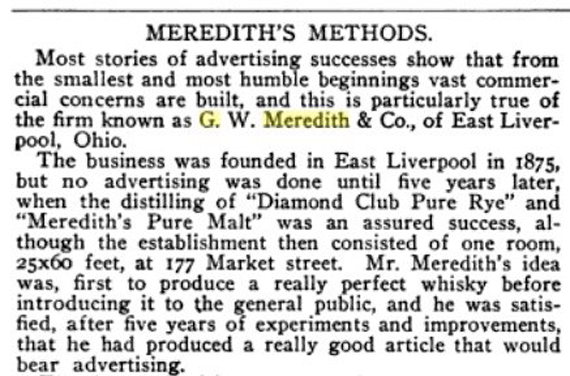 George W. Meredith, once a pottery jiggerman, rose to fame and fortune on the quality of his principal product, "Meredith's Diamond Club Pure Rye," . . .
Meredith's local operations ceased in 1907, when East Liverpool went dry in a local option election, but he was to reap another fortune in business and real estate operations in Atlantic City. 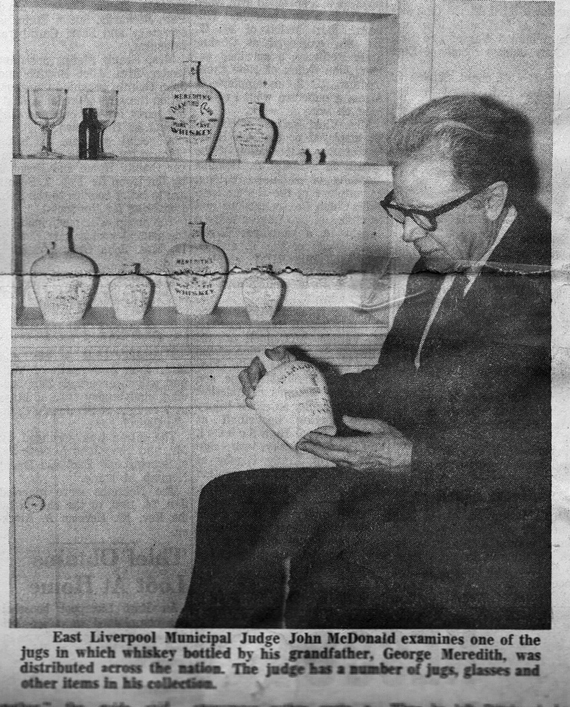 The unique ceramic containers in which he bottled his principle product are sought avidly by antique collectors owing their fame in part to the fact they were produced by the firm Knowles, Taylor and Knowles, the same plant that made nationally famous Lotus Ware. Grandfather of Municipal Judge John B. McDonald and Mrs. Jason H. Brookes, Meredith used surprisingly modern techniques in merchandising his product. G W Meredith, Western Druggist Vol. 24, issue 2, pg 119. Not one to hide his light under a bushel, he advertised daily on the front pages of the local newspapers, hawking the quality and medicinal value of his whiskey. One particularly flamboyant broadside assured the public that:"A nip of Meredith's Diamond club Pure Rye Whiskey is better than 10 doses of medicine." Old-timers recall that is advertising messages were " painted on every rock between downtown and East End and on most of the barns for miles around." One of his most famous signs was painted on a boat that was moored permanently at the Broadway wharf. 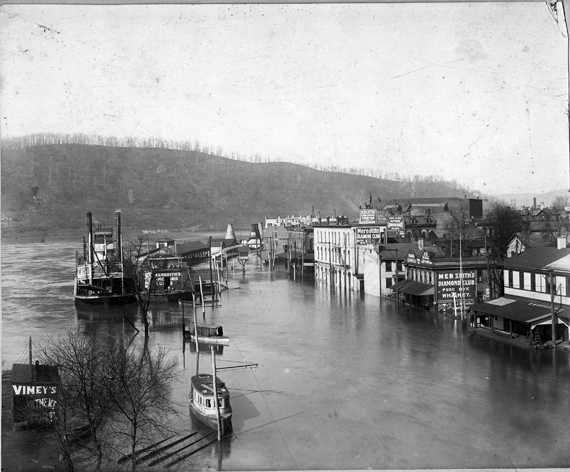 It is reproduced as part of a painting scene by Ernest C. Smith, local artist and boat model builder, and appears in many early photographs of the river front. Although it was the rye that went down in the annals of local history, his bottling firm offered a full line of liquor, wines and gin. 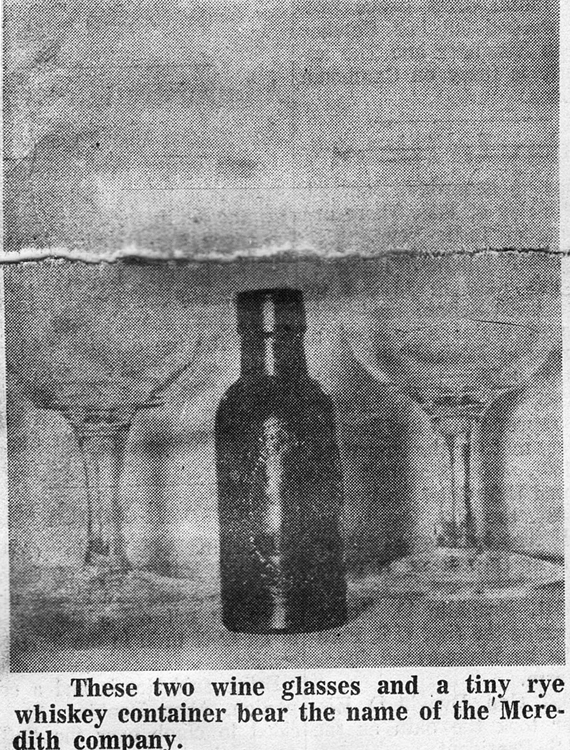 It was the distinctive container used for the rye that causes Meredith's name and saga to live on. The KTK jugs. One range in size from a quart down to a tiny container about an inch high which was a watch charm novelty. Because of their decorative quality many were kept in family cupboards after the contents for gone. They were made of the same body that was used for the famed Lotus ware, named the apex of Chinas at the Colombian Exposition in Chicago in 1893.. Most of the white jugs were decorated with a green decal, although there are a few decorated in red. The usual asking price for the quart size is $25, Judge McDonald says. He has a collection of about a dozen of the jugs. 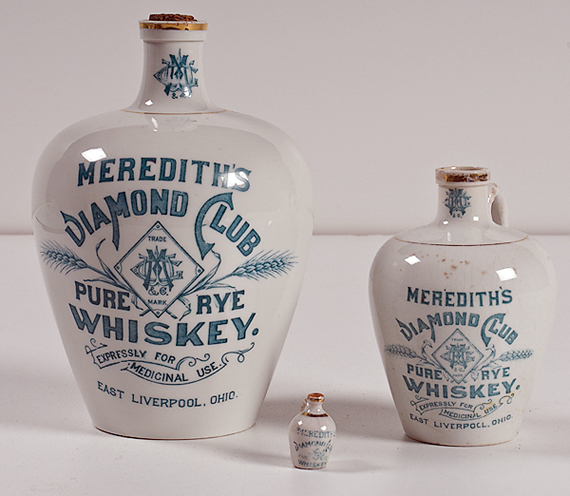 The intricate, ornate wording of the decal says: " Meredith's Diamond Club Pure Rye whiskey. Expressly for Medicinal Use. East Liverpool. Ohio. "Meredith's trademark, comprised of the and intertwined letters " GWM," appears on the neck of the jug and in the center, at its widest point. Meredith usually advertised his fame product as "The whiskey without a headache." At the height of his business, he was selling a case of a dozen bottles at less than one dollar a quart. Today, the containers alone will be worth $300. Meredith issued a price list about 1906 that offered a dozen of the quart jugs at $11.50, but the price dropped $10.50 if the customer took 10 cases are more. His pint China jugs sold it two dozen four $12.50. The half pints brought $11.50 for three dozen. The prices, along with drink recipes, poems and testimonials from drugstores and saloons all over the country are shown in the "Bartenders Guide" obtained for the judge by Standley T. Hilbert. The business flourished [until the town went dry in 1907. In 1908 he moved his business to Pittsburgh and had the East Liverpool, Ohio name removed from all future whiskey jugs]. It centered in what was once the Brunt Opera House, now called the Betz Building . . .
Brunt Opera House at the end of its "life." The McNicol Opera House, on Market Street between Third and Fourth Streets, opened to the public in 1881. The three-story brick structure had a seating capacity for eight hundred patrons. In succeeding years, under the names of the East Liverpool Opera House and the Brunt Opera House, the "elegant" house delighted local patrons with a variety of presentations. On 31 October the "best show of the season ... 6 Peas in a Pod' was presented by Rentfrow's Jolly Pathfinders, accompanied by music featuring the Silver Coronet Band and an Operatic Orchestra. During the 1886 season, stars such as Mattie Vickers, Lilly Clay, and Cora Van Tassell appeared in East Liverpool in such plays as Skipped by the Light of the Moon, the "comedy sensation of modern times." In 1886 when a second entertainment hall opened in the town, the editor of the Review, perhaps a little excited, announced that, "East Liverpool is fast assuming metropolitan proportions." When the new Mozart Hall on Sixth Street opened to a "packed house," the editor was in attendance. He thought the presentation was "varied and highly amusing entertainment, at the same time moral in its tendencies, being entirely free from the vulgarity, low slang and sensationalism so often found in the popular amusements of the day."" The City of Hills and Kilns. By this time, Meredith also had helped organize and was principal stockholder in the Crockery City Brewing and Ice Co. and also owned a controlling interest in the Colonial Co., a River Road pottery that operated six kilns. He did not distill alcohol, but purchased the grain neutral spirits in bass quantities and blended his own brands, adding the flavoring and coloring. Local lore says the "Diamond Club" brand name was borrowed from the leading organization of businessmen, boss Potters and politicians. There evidently was a dispute over use of the "Diamond Club" name for the brand of whiskey. But it ended when the organization decided to switch rather than fight, and adopted the name "Buckeye Club," which it was to use for several more generations, still the most outstanding club of its kind in the city. Meredith operated the business and a flamboyant manner designed to keep his products names before the public. Harold B. Barth, curator of the East Liverpool historical Society Museum, tells how Meredith turned to temperance parade was own advantage in the early 1900's. "It was a sweltering hot day in mid summer when the 'drys' put on a parade in support of their cause and a route let along market Street directly in front of Meredith's," Barth recalls. "They were perspiring profusely as he trudged up market Street grade. Each wore a strip of white ribbon in his lapel symbol of the temperance movement. "Meredith saw the parade approaching and noted how hot the marchers were. He placed a barrel in the street filled with cardboard fans of the type people used in those days to waive in front of their faces and stir little breeze on unusually hot day. As a parade passed, he hand out one of the decorative fans to each of the marchers. Most of them accepted gratefully. "And the parade moved along, with many of the temperance supporters waving the fans. On the back was the printed legend: 'Drink Meredith's Diamond Club Pure Rye Whiskey.'" Meredith distributed 72 page "Bartenders Guide" that not only listed recipes for dozens of drinks but also quoted price lists for his products, testimonials and a piece of doggerel praising the rye as the best cure for a whole host of ills. It also included a promotion piece for coupon merchandising scheme that was the forerunner of today's trading stamps. The advertisement pointed out that purchasers receive one coupon with every case to the pure rye whiskey. It said: "For 10 coupons we send you one jardiniere and pedestal, for 20 coupons one elegantly decorated toilet set, for 30 coupons one fine dinner set." It was signed: G.W. Meredith & company, largest whiskey bottlers in America. "His other best sellers were "Meredith's Malt Whiskey" and "Meredith's Celery Gin Tonic. "The bartender's guide also advertised a long list of champagnes, Claiets and Rhine wines. Then there was a product called "Tiger Head Brand Old Tom Gin" that wholesale for 75 cents quart. Meredith said the beverage " is used extensively for medicinal purposes, and kidney diseases and ailments of a like character. Meredith also declared that his malt whiskey " is officially recognized by the medical profession in every part of United States as the purest on the market." There was magic too, in his celery and pepsin bitters. "It is acknowledged to be unequaled as of bracer and appetizer and as rejuvenator of a debilitated syste,." In barrel lots, he sold whiskey as cheaply as $1.50 a gallon. The Diamond Club variety brought $2.50 to $3.50 a gallon in barrels. Various brands of bourbon sold $1.50 to two dollars a gallon barrels. the bartenders guide listed whole series of ecotic recipes, of which the "Blue Blazer" apparently was a prize-winner. It called for combination of powdered sugar, dissolved in hot water, and a wine glass full of Tiger Head Scotch whiskey. "Set the liquid on fire, and while blazing, for three or four times from one mug to another," the guide said. " This will give the appearance of a stream of liquid fire. Twisted piece of lemon peel on top with a little grated nutmeg." 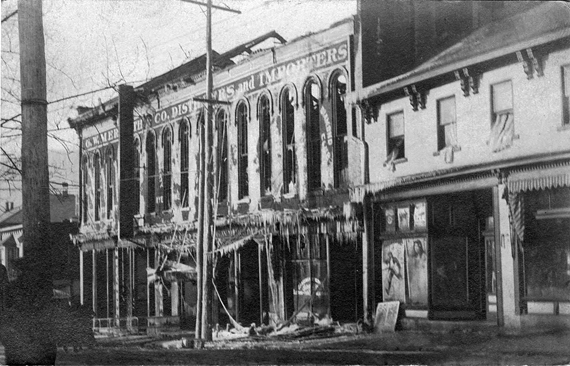 "As this preparation requires skill, it is quite the requisite that the amateur should practice with water at first,"Meredith's recipe warned.
. . . McCord wrote, The family home was a big brick structure on Broadway and has been the Eagles Lodge headquarters for many years. At the time of the temperance campaign that was to put Meredith out of business, Barth remembers a monster "dry" rally on the Diamond at which the principal speaker was a fiery preacher named Pratt. At the height of his condemnation, of the Demon Rum, an unknown to dissenter hurled a brick from the rear the crowd, striking the Rev. Mr. Pratt. And in the sensation that followed, an anonymous author wrote a widely circulated poem," Who hit Pratt with a brick?" "It was a pretty good poem," Barth remembers. "I have a copy of it." Barth also remembers that was then the Brunt Opera House because it was there that he saw his first play as a child of six or seven. In those days, it was legal to use the second floor of building four theater. That was the way the Brunt's functioned, with the "opera house" on the second floor. "I remember the overture by an 'orchestra' of three or four pieces and then the curtain went up," Barth recalls. "An old – looking man came out onto the stage and said a few words. Then he appeared to go to sleep. The production was 'Rip Van Winkle.' I curled up in my seat and went to sleep too. It was many years later I saw the play again and found how all came out." After the whiskey business folded here when the local option election made the town "dry" 65 years ago, Meredith was soon in business in Pittsburgh, where he opened a wholesale liquor establishment on Penn Avenue, near the Pennsylvania railroad company station. Judge McDonald was in the place as a boy and recalls that " bottles of whiskey were stacked on shelves floor to the ceiling, with ladders on rollers – the kind they once used in shoe stores – to help the clerks reached the stock." Meredith had summered at Atlantic City for many years. 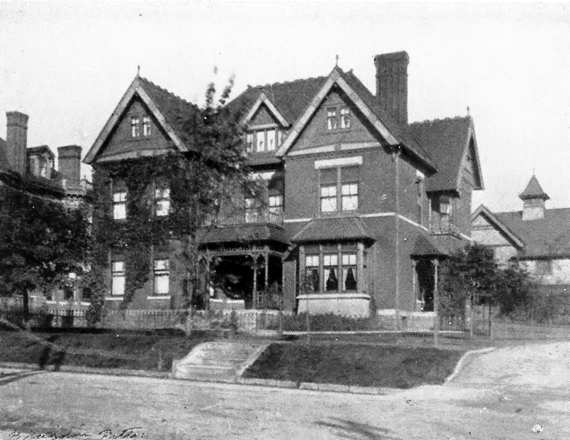 When he left Pittsburgh he bought a large ornate home about half a block from the Boardwalk, midway between Fitz-Carlton and Ambassador Hotels. The Judge remembers its most striking feature, an open, circular staircase that reached from the entryway to the top of the three-story structure. The home later would become one of Atlantic City's most famous nightclubs after it passed out of Meredith's hands. In the resort city, Meredith bought and sold real estate. He acquired several buildings and build at least one. True to his training, a window bottling business again, for what was then a very popular orange soda pop called "Whistle." Always a promoter, he set up a Boardwalk display in which an automated human figure poured "Whistle" continually into a glass and never overflowed. As a boy, the judge often spent a month or six weeks with his grandfather in the big Atlantic City home. Meredith died there of pneumonia on March 20, 1925. He was 74. 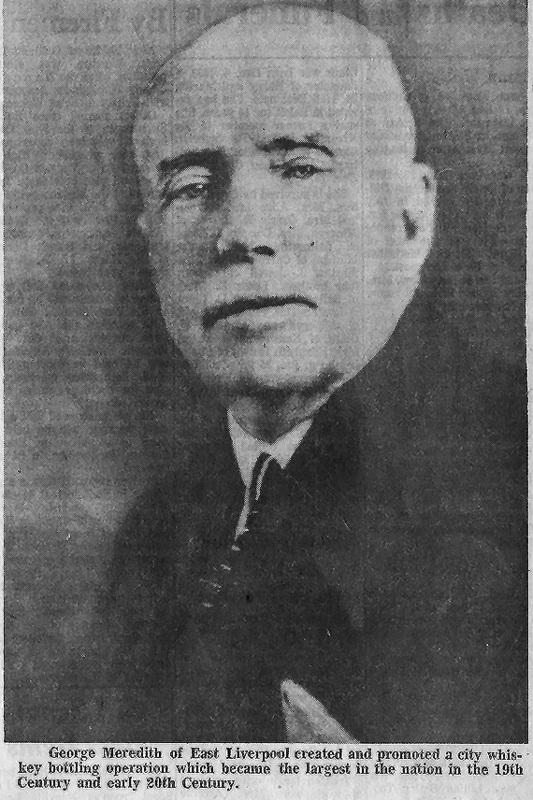 It was the middle of an era of national prohibition against the sale of beverage alcohol, and the flowery death notice in March 21 addition of the Review – Tribune referred to him only as " retired East Liverpool businessman" without saying one word about his career and whiskey business. But fittingly enough, he still was a member of the Buckeye Club. Former home of Homer Laughlin, it became the Meredith Residence in ELO. Scroll down to near the bottom of the article.